YOUR HOME CAN BE FEATURED! A year ago our friend Mark obliged us with his new framed Homestead Prints! 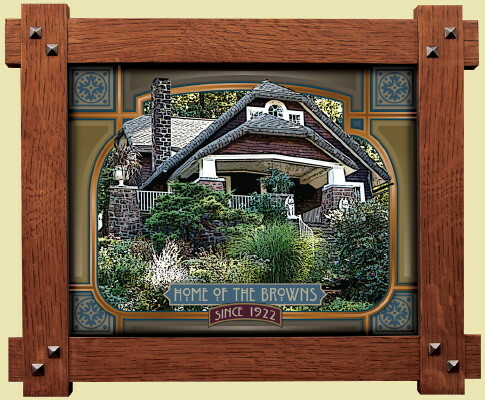 Due to their popularity, we have again asked Mark to go a step further and use house photographs as a background to create a more Custom framed Homestead Print. WOW! 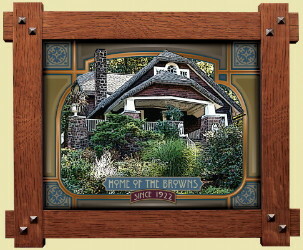 Mark has done it again using a gorgeous sample of a Pennsylvania Arts & Crafts Bungalow together with a choice of four inserts per the above samples. 1) Choose one of the four inserts above and order below. 2) Then send a color photo of your house to sales@fairoak.com. The photograph must be digitally taken with a camera or quality scanned from a printed photo. The image should be about 8�x10� at medium to hires (200 to 300 dpi). We will evaluate your photo and advise if your photograph quality is not adequate. 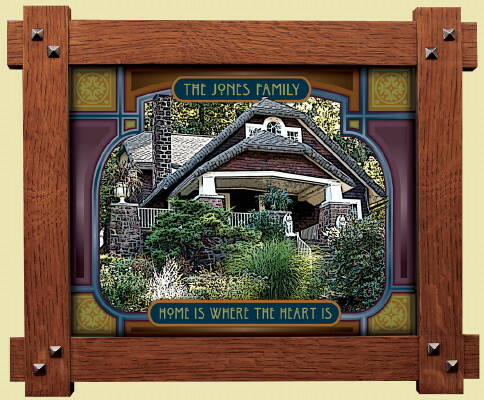 3) If we accept the photograph, we will prepare a proof of your framed Custom Homestead Print. The charge for this proof is $25 when we accept your photograph. Please allow up to 2-3 weeks for us to return the proof for your approval. 4) The proof approval step does allow a one time request for reasonable changes. 5) If/when you approve the proof, return to our website and order your framed Custom Homestead Print. The additional charge for printing and framing your Custom Homestead Print is $275. Please allow up to an additional 2 weeks for delivery. There is also a $20 UPS packing and shipping charge. Shipped from east central Pennsylvania, we must also charge Pennsylvania customers a 6% Sales Tax. The framed Custom Homestead Print is first designed on the computer and a print proof is submitted for your approval. Upon your OK, the image is then giclee printed on canvas and laminated on gatorboard. Framed in a solid oak Craftsman-style frame and finished in a medium reddish-brown stain, there is a saw-tooth hanger on the back. 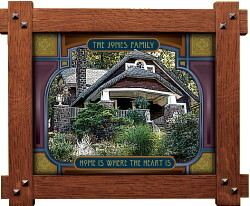 All handcrafted in Pennsylvania, this is a beautiful Arts & Crafts item completely Made in America! A word of caution: keep in mind usually there are slight color variances between all pc monitors and cell phone screens. As a result there may be slight variations in color between your proof and your delivered Custom Homestead Print. Also, since your Custom Homestead Print is completely personalized with your house photo, the print is not returnable. We can�t wait to craft one of these spectacular framed Custom Homestead Prints for you!